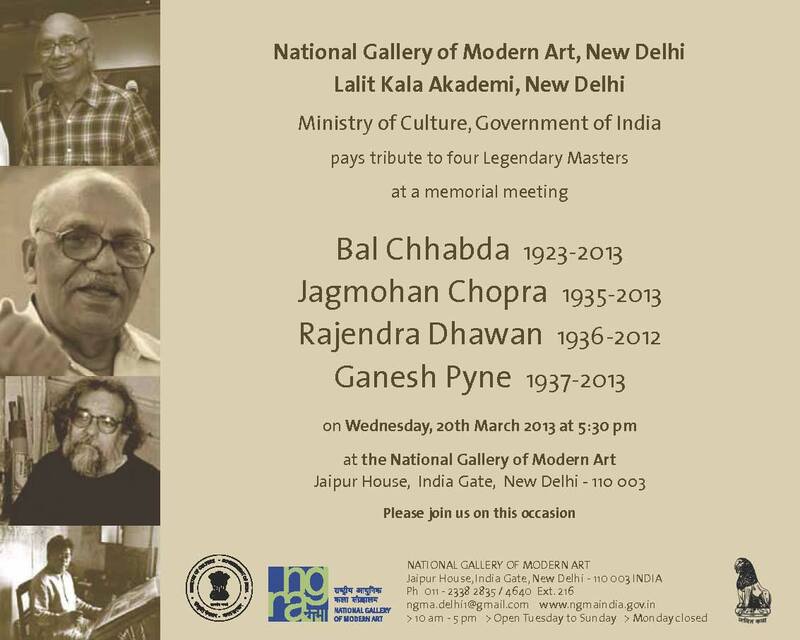 New Delhi: The National Gallery of Modern Art, the Lalit Kala Akademi and the Ministry of Culture, Government of India are holding a memorial for four Legendary Masters – Bal Chhabda, Jagmohan Chopra, Rajendra Dhawan and Ganesh Pyne on March 20, 2013 at 5:30 pm at the NGMA, New Delhi. It is great to see that two institutions, the NGMA and the Lalit Kala Akademi, are coming together to mourn the loss and celebrate the lives and work of three great Indian artists. Please do attend if you are in Delhi.